The Petzl Nao is a great headtorch for serious off road running so is the upgraded Nao+ with 750 lumens even better? 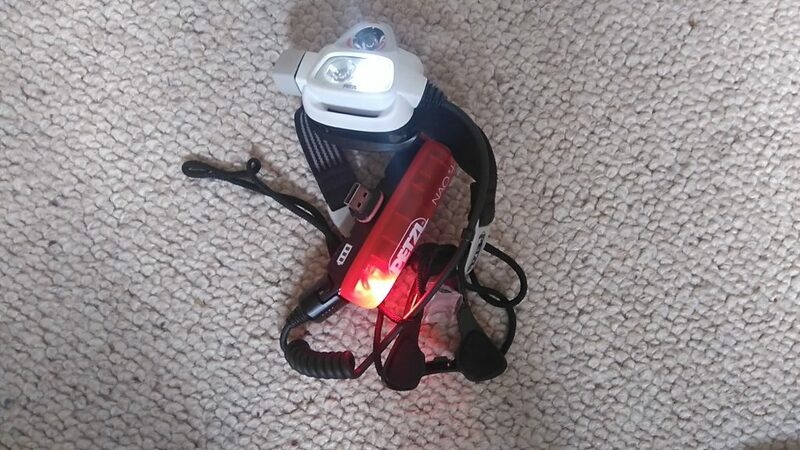 I’ve had the second generation Petzl Nao headtorch (the 575 lumen version) for a couple of years and have had chance to get the most out of it on long overnight runs. I used it on the Charlie Ramsay Round and the High Peak Marathon where long battery life was vital and the reactive lighting setting was really useful when using a map and compass. I’ve been fairly impressed with it so wondered if the updated Nao+ is even better. Looking at the Nao alongside the updated Nao+ the most obvious difference is the colour scheme with the Nao+ having a red, black and white head unit as opposed to the old light grey and white. Also the battery compartment is changed to red and black from the old grey. 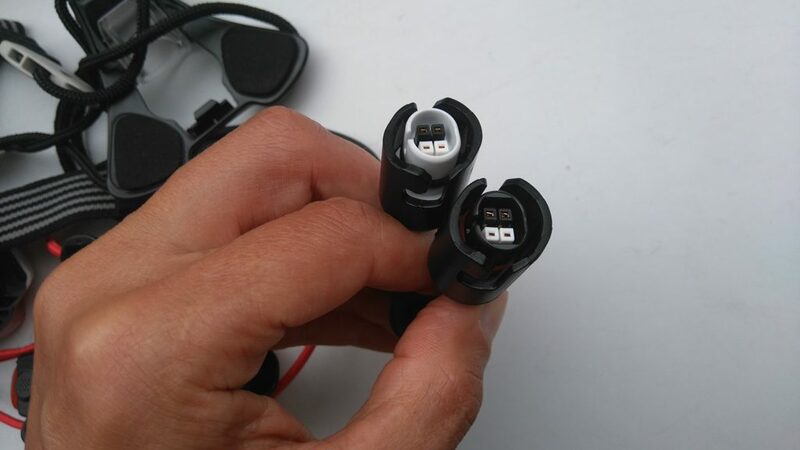 Shape and size are still the same but there is a change to the attachment system with the non elastic black cord being replaced by elasticated red bungee type cord. I feel this gives a slightly better fit and is more comfortable. Other than that the versions appear the same. Cosmetics aside it’s the performance and operating system where the main differences lie. The Nao+ has the same Reactive Technology which senses the ambient and reflected light and brightens and dims the torch accordingly. Some people don’t like this but if I find that it is very useful if doing a lot of navigating, especially with a plasticated or laminated map as it significantly reduces the glare. Yes the Reactive function is affected by fog and even condensation from your breath on a cold night, but one twist of the large button switches to constant mode. Although still powered by Petzl’s own 3.7 V 2,600 mHa USB rechargeable Li-ion battery, output has increased from 575 to 750 lumens (actually I found the existing power to be perfectly adequate, even in the Mamores in the wee small hours). What is more useful is the increased battery life which now gives a claimed 12 hours in Reactive mode at 305 lumens. Whilst I’m generally sceptical of manufacturer’s claimed performances I can say from experience that it does have great battery life. I used the Nao+ on the Bob Graham Round using the low (305 lumen) Reactive setting and after 6 hours use the LED indicators still showed 2 bars (3 bars being fully charged). My old Nao only just got me through the night during the High Peak Marathon as it dimmed to reserve mode just as dawn was breaking, the Nao+ is able to last all night. One new feature on the Nao+ is the addition of a rear red LED. This is very useful if leading a group or running along a dark lane with your back to traffic but it’s not a feature I want for racing as I don’t want people following me! So you would think “easy, just turn it off” but therein lies a problem; you need to use Petzl’s Bluetooth app to do so. 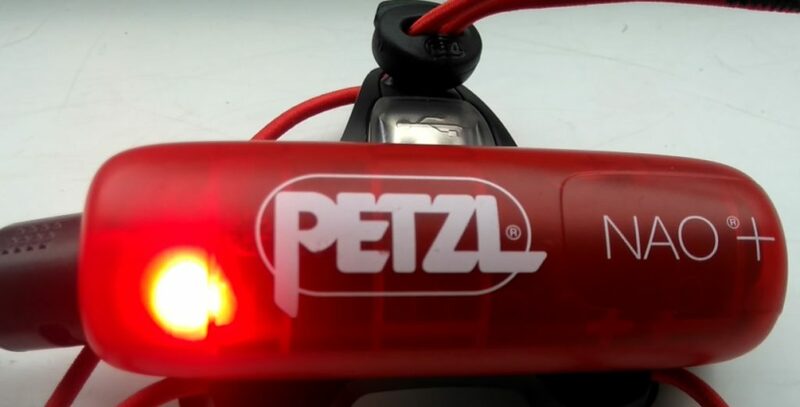 Yes, if you want to turn the red light on or off mid run you have to fish out your smartphone, turn on Bluetooth, open the MyPetzl Light app and then change the settings. Oh and it’s probably raining and you’re wearing thick gloves. Great technology or a bit of a faff? You decide! 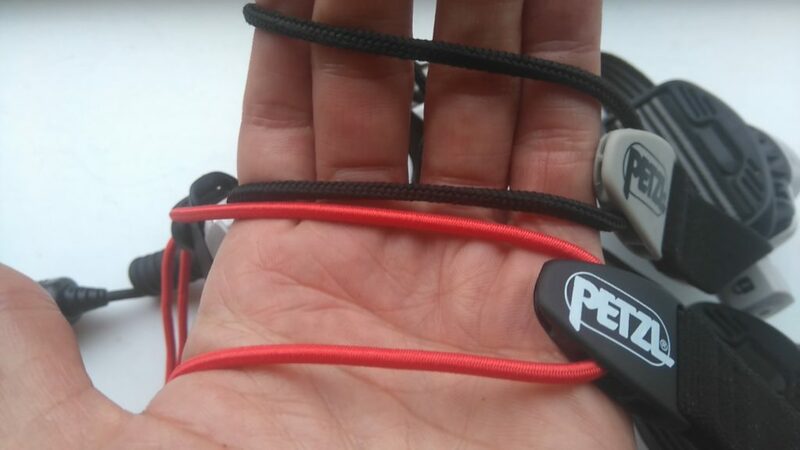 Which leads to the main difference between the latest version of the Petzl Nao and the previous incarnations. Now, to change any of the preset modes on the torch you need to use the “MyPetzl Light” Bluetooth app. Petzl market this feature saying that this makes it easy to change the settings in remote locations, so for example if you haven’t been able to recharge the battery you can reduce the brightness and thus prolong battery life using your phone. Hmm, not sure if I buy that! To me it’s just another app to bloat my phone and for some people who don’t bother to update their phones the app might not even be compatible! 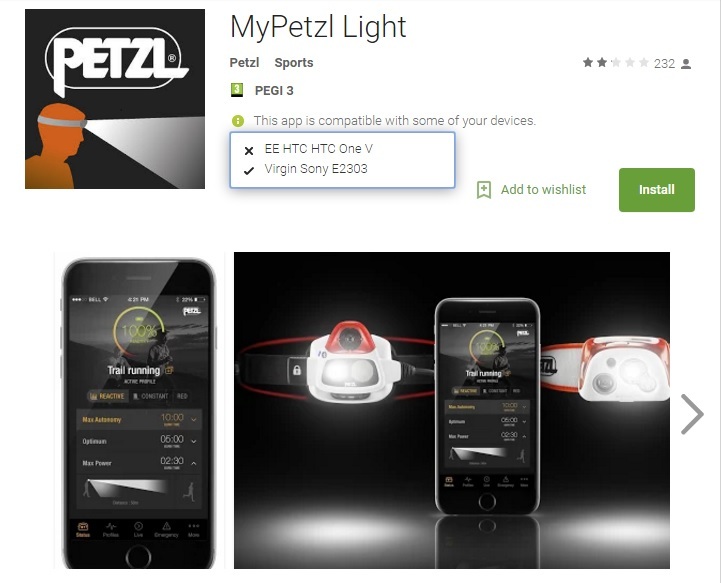 Petzl’s Bluetooth app – great idea or a gimmick? On the earlier Nao models you changed and customised the settings by plugging the torch into a computer and using the Petzl OS software, but the software doesn’t work with the Nao+ so you’re forced to use the Bluetooth app or stick with the factory settings (the latter have worked fine for me). Another annoyance is that the battery from my Nao isn’t compatible with the Nao+; so if you did want to do an event where a spare battery was needed you’d have to fork out for a spare (around £50) as the new version doesn’t allow for the use of AAA batteries as an emergency backup either. 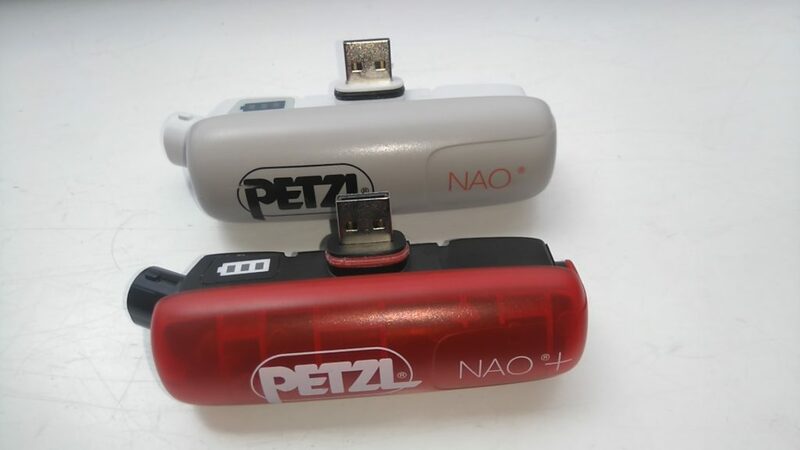 Petzl claim that the batteries aren’t interchangeable even though the connections look identical so I had a try at swapping them around. Oddly the Nao+ battery pack does fit onto the older Nao and the torch works, but annoyingly not the other way round. The connector doesn’t accept the battery and I’m reluctant to force it and damage something. the new battery works on the old torch but not vice versa! I’d hoped that the Nao+ would have a strobe mode – it does but it can only be switched on via a paired smartphone (you can programme a Morse Code signal using the Bluetooth app). Not ideal if you’ve fallen and broken your ankle or become so hypothermic that you needed to signal for help! So whilst almost all cheap head torches can simply be switched to give an emergency signal the one torch that I am most likely to take with me to remote locations and runs where the consequences of injury are serious can’t! Just like the previous version of the torch the Nao+ gives a great spread of light and now has even longer battery life. The big switch is easy to operate even with bulky gloves. Reactive lighting means that you don’t get dazzled when looking at a map and it preserves battery life. If you don’t like the feature then one twist switches it off. The new bungee cord on makes it slightly more comfortable than the previous version. The Bluetooth app isn’t for everyone! No problem if settings could be customised using Bluetooth as well as the existing OS system, but not instead of. Compatibility with the existing Nao battery packs would be a welcome feature (particularly for anyone upgrading from the Nao 575 lumen torch). The need to use a smartphone app just to turn the rear LED on and off is just too much hassle. An easily accessible emergency / strobe function as available on budget head torches should be a standard feature. The new Petzl Nao+ retains the great features of its predecessor and adds even more brightness and battery life. It is certainly my first choice torch for long overnight runs involving navigation. However it is over complicated by reliance on a smartphone to change some of its basic settings. Sometimes simplicity rather than complexity is a selling point. 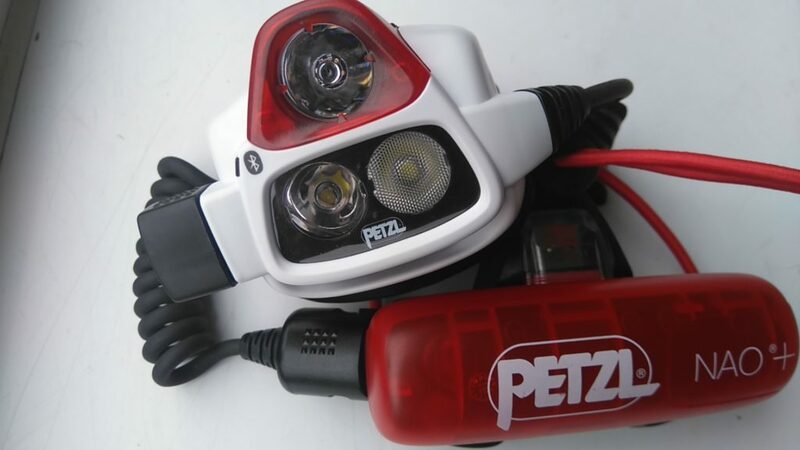 Posted in Head Torches, Reviews and tagged head torch, Petzl Nao. Interesting that you think the battery life is good. I’ve had two so far and on the reactive trail running program (used on the 16hr setting) I’ve struggled to get through the night. Using it on the Lakeland 100 (so in the middle of summer with short nights) it was fantastic at the start, but by the end of the first night the light was hardly enough to see the ground a few feet in front. When I checked on the phone it was reporting approx 40% battery left. Weirdly when I used it again the following night to walk back from the pub the light was bright again! I returned the first one as I assumed it was faulty, but the replacement has been exactly the same. Not sure if there is some overheating going on, or a bug in the output regulation software, but so far I’ve not been impressed with it. Like you I’m also not impressed that I jade to fork out another £50 for a spare battery either! That’s interesting. I have used it on Reactive setting and got more than 7 hours from it with indication of lots of battery left. However on the previous version of the Nao I had it go into reserve mode after about 5 hrs when I was expecting much longer. I contacted Petzl who admitted it was difficult to estimate battery life on Reactive mode as it’s hard to predict where you will be looking. If you are looking at the ground the battery will last much longer than if you are head up looking further ahead. Sounds like something to go back to Petzl about. Appreciate your review was a year ago, but I’ve just bought a Nao + for the Marmot Dark Mountains race and I’m trying to decide which profile to use! When you say that the “factory settings” have worked well for you. Do you mean the preloaded multi activity profile straight out the box, with just two brightness levels? If so, I shall disable the red back light and wifi and just use max autonomy “out of the box” multi activity profile for my race. Like Darren, I am not convinced that the 3 level trail running profile offers any more advantages for a race that will involve a LOT of map work and slower running. More worried about battery life! What I’d do is change the settings and simplify things with a profile for Dark Mountains. 1 – Adjust the brightness on Reactive Mode so that it gives at least 2 hrs longer than you think you will need. (I got caught out on the High Peak Marathon as the battery didn’t last as long as predicted on Reactive mode – this was with the previous Nao). 2 – Adjust the constant mode to maximum power spotlight. You’d us this when looking for a control. That way you just have 2 settings to choose from, one for most of the time when you are running and looking at the map and another when you want to look as far into the distance as possible. As long as you remember to turn back to Reactive after you’ve used max power you should be ok for battery. The more options you have, the more likely you are to inadvertently use it on a higher power and thus drain the battery. And yes turn off the rear red LED, you don’t need that on! I’m a simple soul and the idea of changing batteries mid race in some of the conditions we’ve had previously does NOT appeal! Was starting to question why I’d bought the damn thing…. I’ve done it three times with an Alpkit Gamma and hand held spotlight which is fine in all but windy drizzle (last year). Hoping this time to be able to see! When I’m setting the single bespoke reactive mode do I pick “Trail running”, or one of the other activities? I don’t think it matters Jim, I think they are just titles and could be called anything. As long as that is the activity that you select to use you should be ok. Once you’ve set everything up test the torch to see if it works as you expect. Thought I’d feedback for the benefit of other Nao + users. Reactive trail running setting adjusted to 12 hours (for safety cushion) worked perfectly on one battery in pretty cold conditions. Had 30% (one LED) left. I also created a 12 hour constant trail running setting in case fog etc caused sensor problems (Didn’t use). Switch froze at one point in the wind chill but easily freed off! I was able to turn the light off at one point after 7 hours and navigate by starlight for a short while due to the snow reflecting the topography beautifully. Do these lights have some kind of battery saving regulation in addition? When turned back on to the same reactive setting (after maybe half an hour off) light seemed brighter than before probably due battery recovery. Realised it had herefore possibly been getting progressively dimmer overnight. Wasn’t expecting it to do that. I would rather it stayed similar brightness until battery low indicator comes on. Not sure about the regulation. I would have expected it to maintain the same brightness.